Come and get saved by these phoenix firefighters brothers. 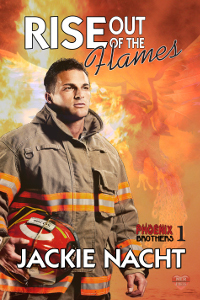 Holden, a phoenix shifter, works at Rhodes Fire Department alongside his family. When he encounters his Sun, Rick, he's half naked on the fire escape and Holden knows he'll do anything to save Rick from the burning building. Even with the world knowing about paranormal beings, Holden has to figure out a way to tell Rick about himself. Phoenixes exist under the radar; keeping to small groups out of the limelight. Slight problem with maintaining secrets since it seems Rick may have unknowingly exposed himself to the phoenixes new enemy. How will Holden protect Rick with what happens when he goes up in flames?